Hamsters are clean critters and tend to keep their sleeping, playing and toilet areas separate. This helps their cage stay cleaner longer, but it doesn't mean you can neglect routine cage cleaning and maintenance. Daily poop scooping and weekly washing will prevent odor and illness while keeping your hammy happy and stress free. Consult your vet if your hamster is not keeping his cage tidy or if you discover diarrhea when cleaning his cage. These could indicate a health problem. Spot clean your hamster's cage daily by removing soiled bedding and wiping down his potty corner with a dry paper towel. Also, remove any uneaten fresh food to prevent the growth of fungi and bacteria. Clean the entire cage once each week to keep your hamster happy and healthy. If your hamster does not stick to one spot or corner when going potty, you may need to clean the cage more often. The California Hamster Association recommends cleaning the cage on the same day every week to minimize stress in your hammy. 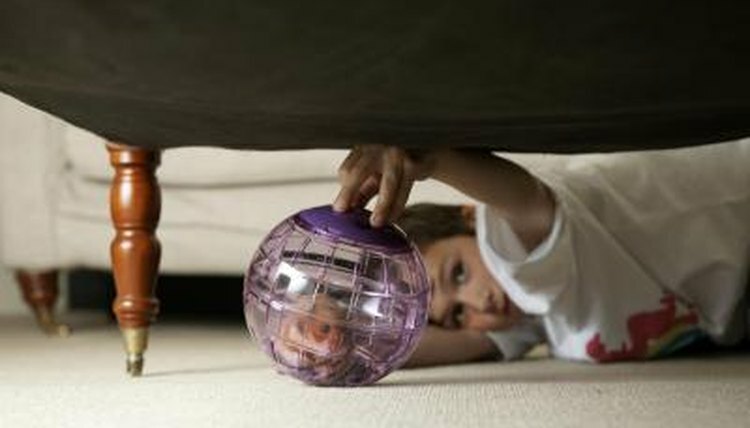 Place your little critter in a safe location, such as a rodent playpen or hamster ball, while you clean his cage. Check on him periodically to make sure he's not getting into any trouble. Remove about half of the larger items from the cage for cleaning with hot soapy water. Remove the other half and set aside. You want to leave some items in the cage that smell like your hamster. These items can be washed next week. Empty your hammy's food dish and place it and any water bottles near your sink for cleaning. Scoop out all litter and discarded food from the bottom of the cage. Remove the wire cage top from the solid bottom, if applicable. Scrub the entire cage, including the wire bars, with a sponge and antibacterial soap. Allow the soap to sit on the cage's surface for 10 to 15 minutes. Rinse well and dry thoroughly with clean paper towels. Set aside. Use hot water and antibacterial soap to clean the items you set aside for washing. Also, scrub the food bowl and wash any water bottles with hot water. Make sure you clean the mouth piece. Rinse all items well, dry thoroughly with paper towels and set aside. Wipe down the inside of the cage with white vinegar if there's an odor problem. Allow to air dry. Reattach the top of the cage to the bottom part when all pieces are completely dry. Place new bedding into the bottom of the cage before replacing your hamster's toys, wheel, food bowl, water bottles or other items. Return the unwashed toys or other items to the cage.